As a first step go to the Shopify app store and get the Nosto app which will initiate the setup. The first actual installation screen asks you to choose your installation type. Most common one is to install Nosto directly to the live theme by selecting Set up Nosto to my store. In this guide we cover only these steps as it’s by far the most common scenario. Additionally, if you are still building your Shopify site and would simply like to try out what Nosto would look like, select Test Nosto on my dev/staging store. This will create a free sandbox Nosto account so eventually, if you later want to install Nosto on your live Shopify store, you need to repeat these steps and choose the first option in the list, which will open you a new account suitable for live use. 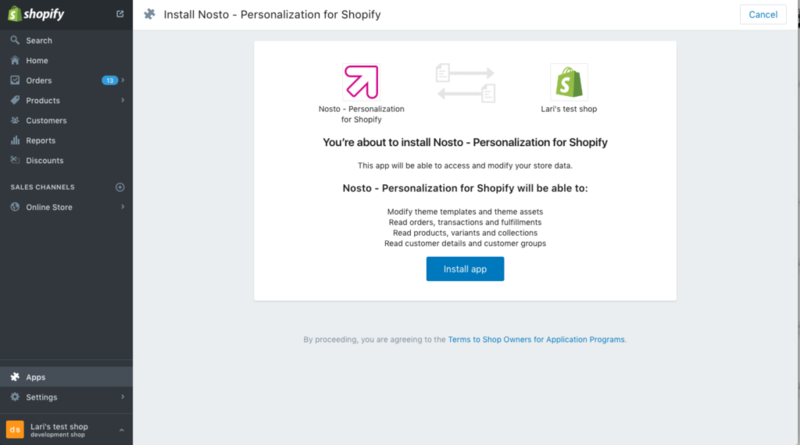 If you are a Nosto partner and installing Nosto on behalf of a client, select I’m a Nosto partner, which will prompt you to connect Shopify store to an existing Nosto account by logging in to the Nosto admin first. Note that if you choose this option, you need to have a pre-opened Nosto account for the store. Contact your partner manager if you need one. The log-in wizard will ask a couple of questions about you, your business and the site itself in next views. Once you’ve reached the view below, clicking continue will send you back to your Shopify admin and ask for a permission to connect your Shopify site to Nosto. Connecting Nosto to your site automatically adds a couple of recommendation placeholders to your theme, but nothing is visible publicly until you actively enable features later from the Nosto admin panel, so it’s safe to proceed as nothing will go live without you verifying it first. Hold on, we’re almost there! The last step required is simply to choose the theme where Nosto is applied. In the installation you can select only one theme, preferably the one which is published and active. Optionally you can apply Nosto to other themes later from the app settings menu once Nosto is installed. Clicking Install will add Nosto to the selected theme. 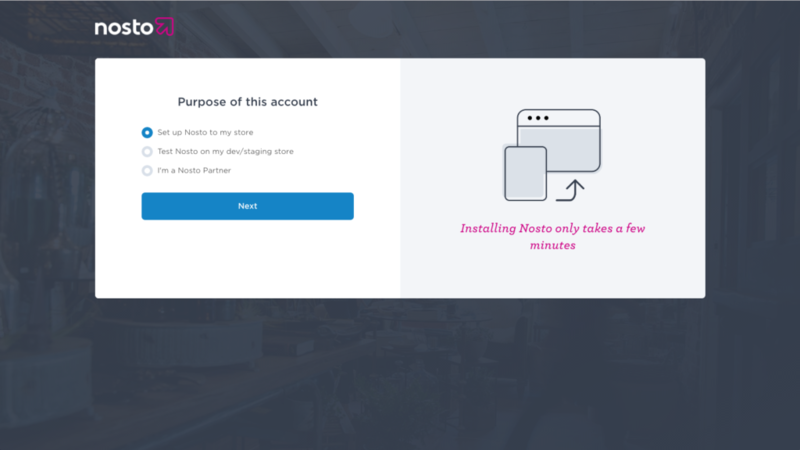 When you’ve successfully installed Nosto and connected your theme and site to Nosto, you’ll be sent to a landing page which directs you to the correct area in the Nosto admin when you’re ready and want to configure enable one or more of Nosto’s features on your site! 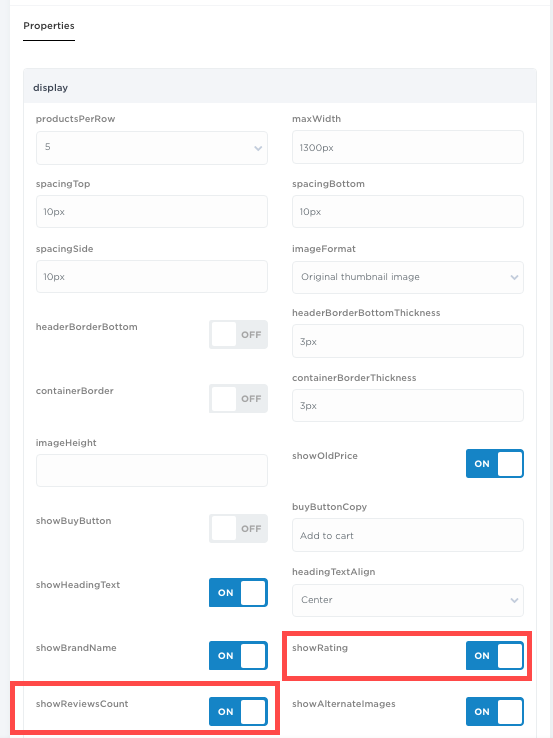 Under the Settings-menu, you can control Nosto settings applied on your Shopify site. 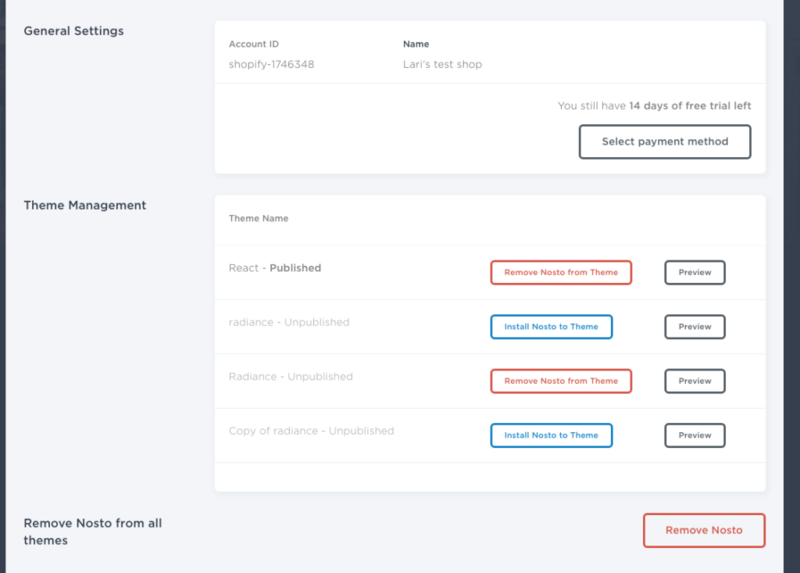 General settings simply present your Nosto accountID and name and prompt to add a payment method along with how much time is left in free trial. Here you can either remove or install Nosto to one or more of your Shopify themes and preview how the site would look like if you would go live there and then. If you want to remove all Nosto code from your themes and essentially remove Nosto, you need to remove Nosto first from your themes by clicking remove Nosto button here. After this step, you can uninstall Nosto app. Removing Nosto will effectively terminate the data exchange process, meaning we can’t track behavioral data from your site or deliver any of our features anymore after you remove Nosto. Connecting site to Nosto will automatically enable data exchange between your site and Nosto. When your site is successfully connected to Nosto, we automatically generate a replica of your product catalogue in our service and keep it up to date. When you connect your site, we also import anonymous purchase history of past month. 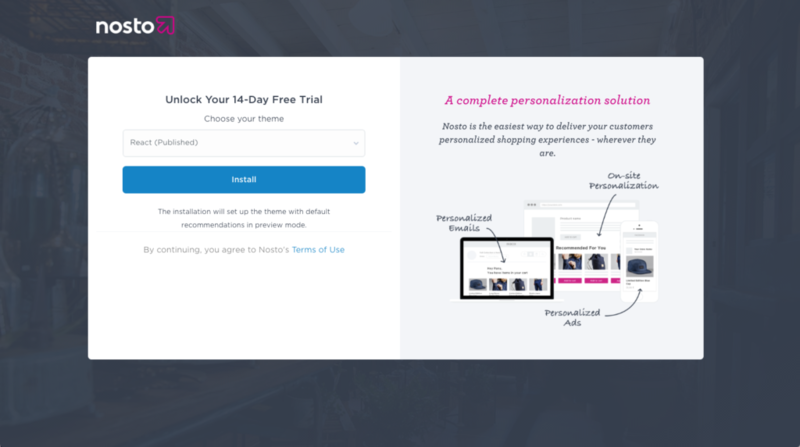 We don’t import personal data of customers who bought from your site when you connect, but only product data or what was sold so that you could start using Nosto features as soon as possible. Technically this is done by processing the order data or in other words by analyzing which products have been commonly bought together. When the connection is successfully established, we start tracking names and email addresses of customers who bought from your site. We don’t collect other personal details such as delivery addresses, phone numbers or collect any payment card information, whereas email addresses are only used for Nosto’s email features and only on your site, should you like to utilize Nosto emails later on. Move the element to the desired spot, depending on your actual Shopify Theme. 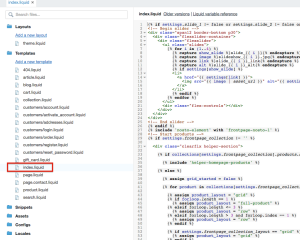 Preview the location by saving the index.liquid page and by opening the edited page template in preview-mode. Nosto natively supports Yotpo user generated content in terms of customer ratings. 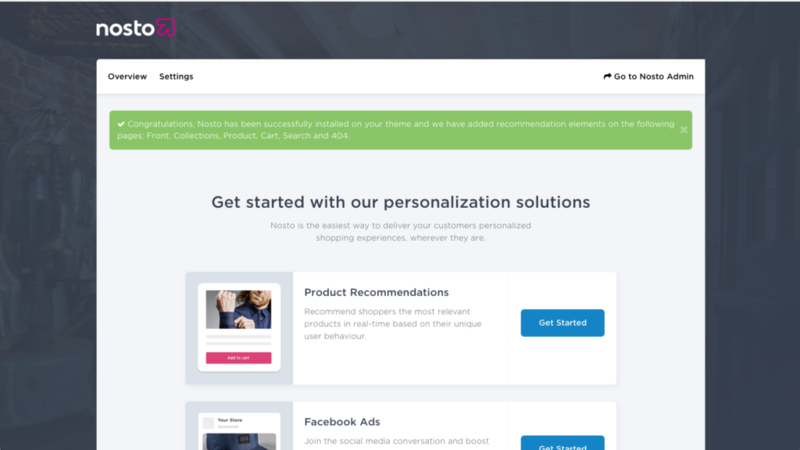 If your site uses both Yotpo and Nosto on Shopify you can enable and make Yotpo ratings visible by enabling these individually for each recommendation on the site, by adjusting the visibility under On-Site > Recommendations > Choose a Recommendation, by toggling the two highlighted visibility controllers in the screencapture below. This’ll then show Yotpo ratings or number of reviews or both depending on your preferences. If a product doesn’t have a rating yet, see Nice Shoes example below, the rating is simply hidden.